Even in the smallest outdoor kitchens some storage will be necessary even if it is just a door to access the gas line or propane tank. 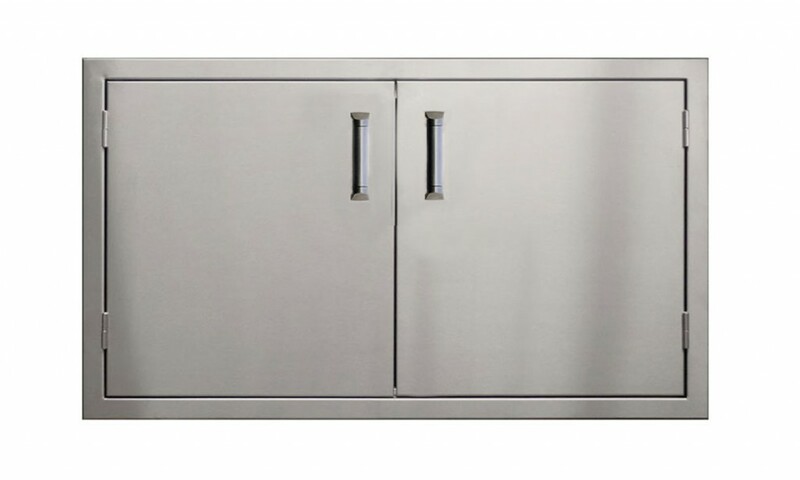 In todays market there is a vast selection of outdoor cabinets, insert doors and drawers made of stainless steel, high density plastics (HDPE) and resins that offer different degrees of functionality, appearance and cost. The large selection can be confusing but we feel it is important to know all the options to be able to select the proper solution for your lifestyle and budget. 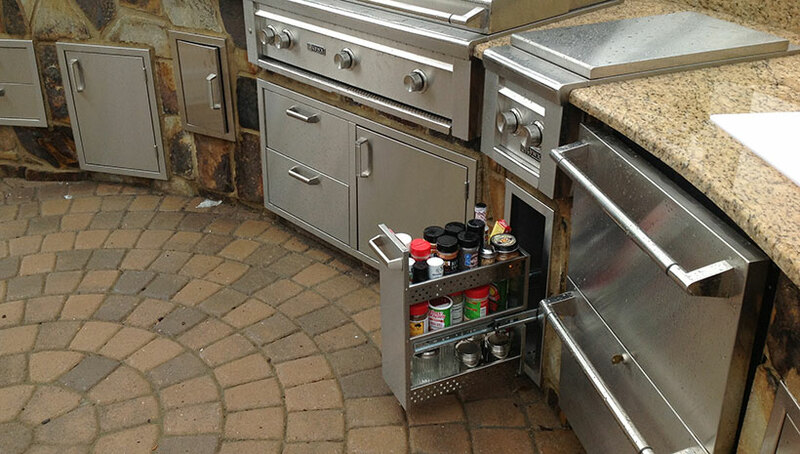 Every outdoor kitchen is unique in its location, size and needs. 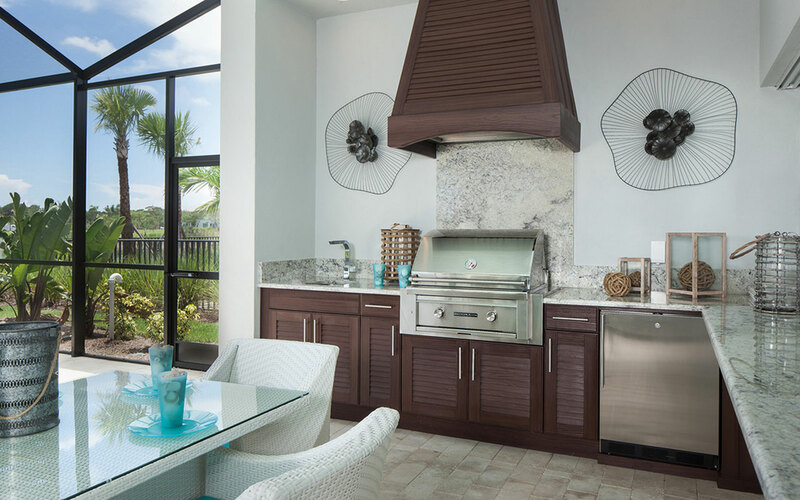 Open air kitchens and kitchens located near the water need to be made of corrosion resistant materials to stand up to salt air and high winds. Kitchens located under a roof or pavilion are somewhat protected and will last a lot longer. Choosing the right materials can provide a kitchen that will look, function and provide a lifetime of enjoyment. 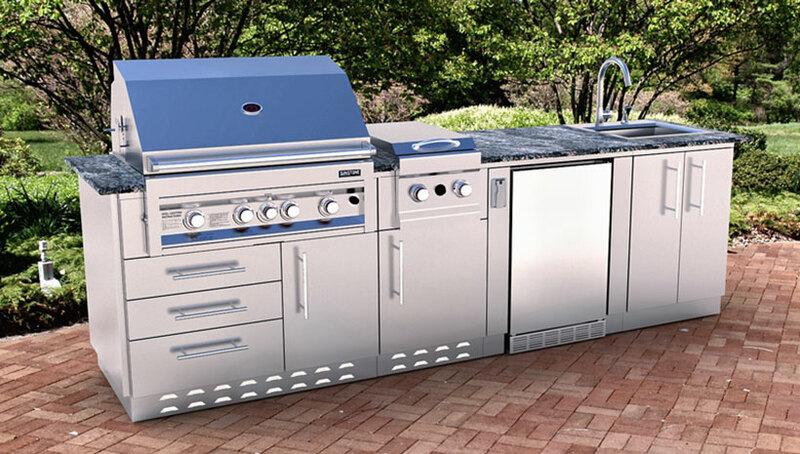 Stainless Steel is by far the most popular material for the outdoor kitchen. It is the most cost effective way of providing outdoor storage. Remember Stainless Steel is an expensive material that comes in many different grades, 304, 316 grades are the most desired and will last a long time, cheaper prices typically mean lesser grades and will not last outdoors. Stainless steel also blends well with stone, wood, tiles and all other finish materials. 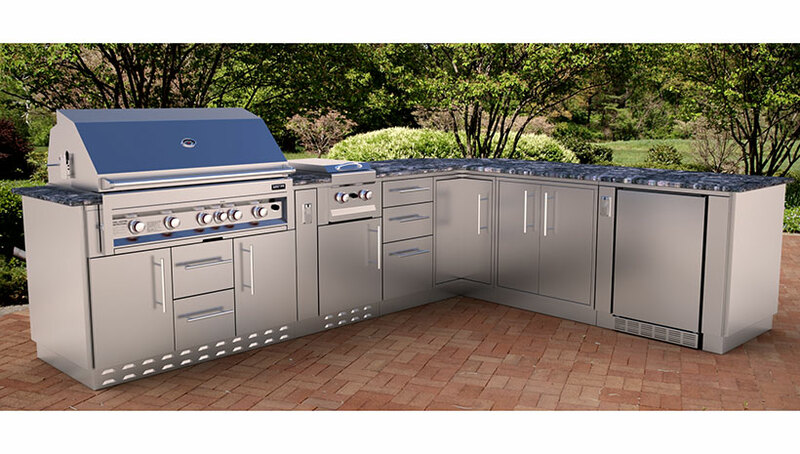 Most grill manufactures offer stainless steel (OEM) doors and drawers that are either made in the USA or imported from overseas. OEM equipment is typically more expensive and usually has the MFG logo on the door or drawer. To save money universal brands are available, they offer the same or higher quality construction without logos. 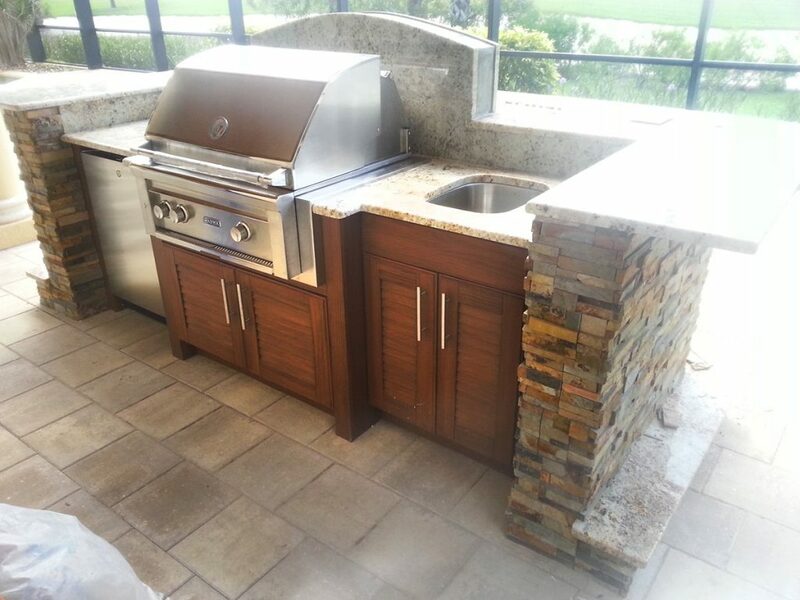 Outdoor kitchens have grown in popularity and with the growth we have seen a lot of new products that offer some interesting alternatives to the old fashion framing or brick and mortar approach. High density polyethylene (HDPE) similar to the Trex and other decking material are fantastic materials that can withstand the harshest outdoor environments. Foam core resins and PVC cabinets offer the rich look of real wood with out all the cons of wood. Cost of these products can be much higher but the labor cost and ease of installation can offset traditional construction cost. Access Doors– Used to gain plumbing and electrical access under grills, side burners, sinks, bar centers and other areas. These consist of a Stainless Steel frame and door only. Access doors are available with single and double doors and come in a large range of sizes. Some doors can be ordered as water tight. Drawers- Storage drawers provide easy storage for grill tools, spices, cleaners, covers and everthing else that can fir in the drawers. 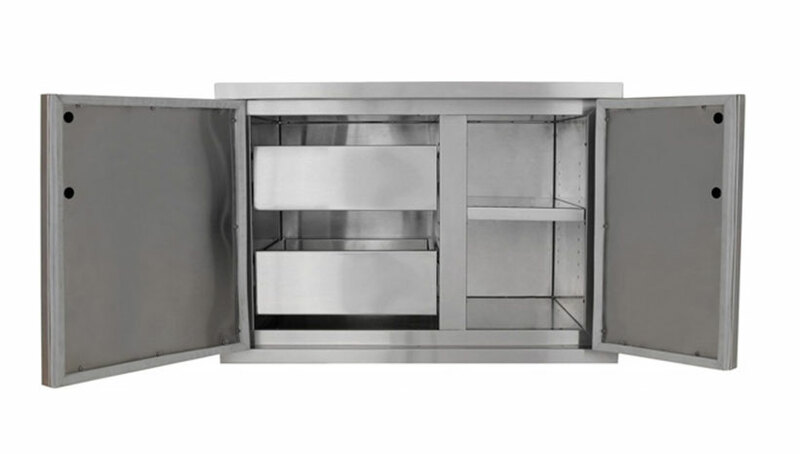 The drawers are totally enclosed and can be ordered as water tight or insulated for hot and cold foods. 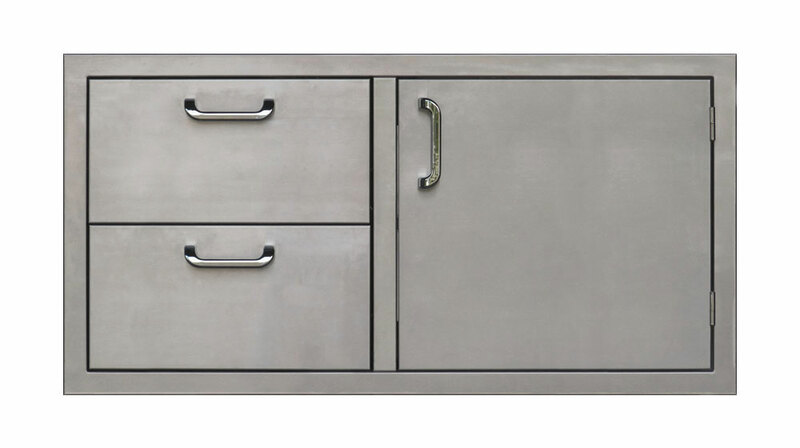 Door/Drawer Combos- Great for under grills and cooking appliances. The combo offers a single access door for plumbing and electrical and a 2 or 3 drawer unit for storage. Trash Centers- Every kitchen produces trash! Trash drawers are a great way to keep the unsightly mess contained while entertaining. 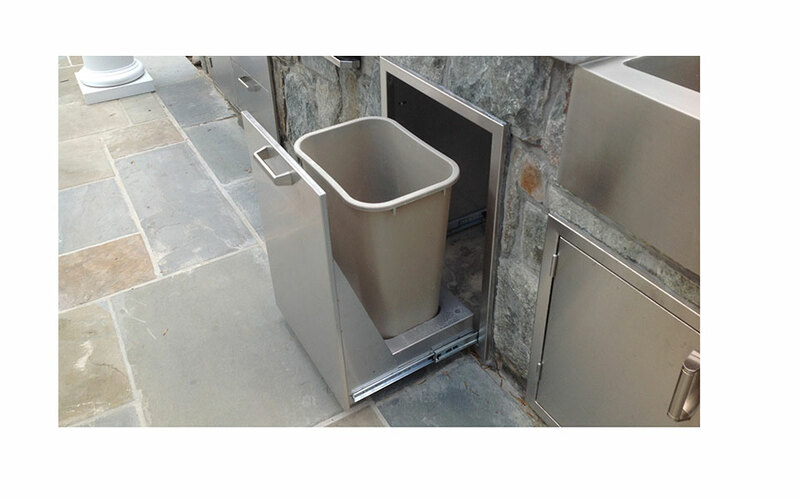 Trash centers come in a large variety of sizes and shapes. Single and double cans are available in pull-out and tilt-out designs. 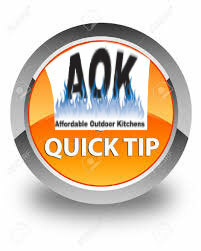 At AOK we recommend the installation of trash drawers, however it is important to remove any trash after an event to prevent the invasion of bugs or varmints from discovering your outdoor kitchen. Dry Storage- If your indoor kitchen is a good distance away it makes sense to have at least one dry storage cabinet that will keep water and pest out. Great for plates, cups, spices and more. Most dry storage units will have adjustable shelves and pull out shelves for easy access to items. Dry storage units also come in different sizes for small to large kitchens. 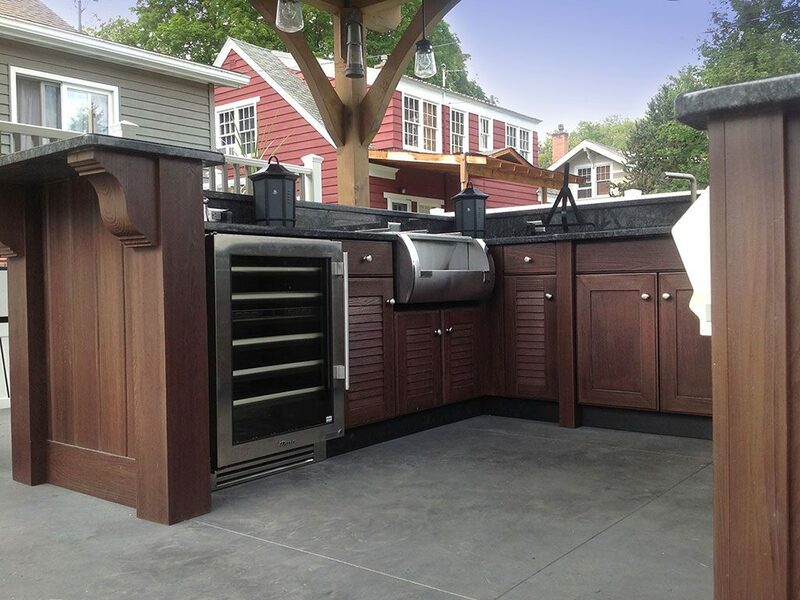 Full Outdoor Kitchen Cabinets- In parts of the country where the weather stays warmer all year round the use of outdoor kitchen cabinets have been popular. With the growth of the outdoor room and outdoor kitchen many people like the full functioning ability of outdoor cabinets. 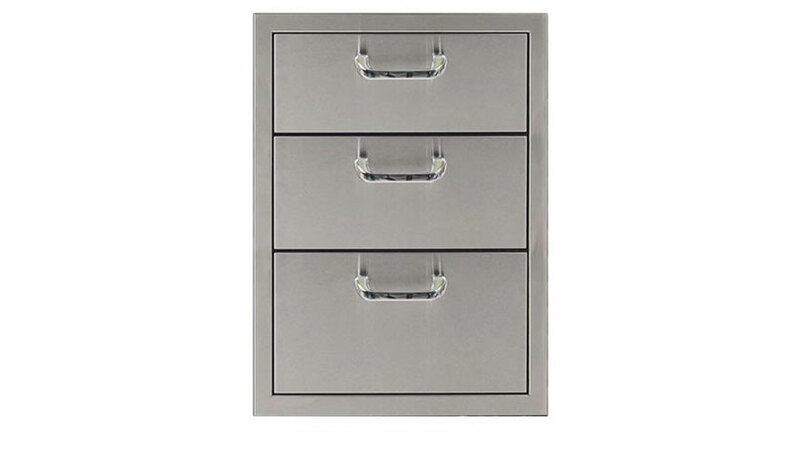 Just li ke the indoor kitchen these cabinets bolt together and have toe kicks with full glide drawers and pullouts. Outdoor cabinets can be made of metal, plastic and wood. With so many choices to make we encourage you have a scale design to help with selection for purchasing and to help minimize construction errors.